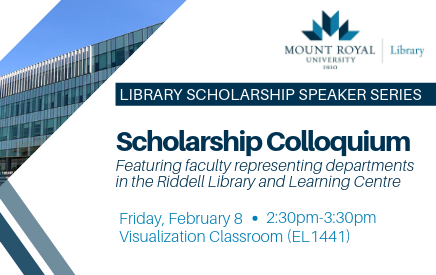 Join the second edition of the 2018-19 Library Scholarship Speaker Series, which will feature faculty from departments within the Riddell Library and Learning Centre. The MRU Facebook Confessions (FBC) page is the focus of research that proves a portion of posts do support undergraduate learning and the academic experience through four main information behaviours: help seeking, advice giving, information seeking, and moderating behaviours. While Facebook Confessions can enable rich peer-to-peer academic help-seeking and other information behaviours, those in official post-secondary roles should be cautious when considering whether to engage in student-driven social media spaces. Operating under the Library Faculty Council, the Scholarship Standing Subcommittee initiates opportunities for academics from all departments in the Riddell Library and Learning Centre to present research in progress or project results in an inclusive and supportive venue where ideas are workshopped and feedback is applied to draft papers or upcoming conference presentations. Sessions are open to faculty, students, and staff.